Demas writes beautifully of a family in crisis, a teen who takes charge of her own life, first love and last love, and how closeness with the natural world forces growth the way a gardener forces early bulbs. I could not stop reading. What appears to Irene to be a calamity is merely the beginning of a journey she didn't know she wanted to take. A compassionate and convincing book. Everything I Was--which answers the question what and where is home--has everything I'd ever want in a novel: engaging characters; a storyline with a surprising amount of tension; a family life that sometimes fits like an outgrown shirt for the heroine, Irene; and a wonderful ending that sits just right. This is a lovely story about a strong, courageous girl and a wise Grandfather - kindred souls who, together, forge new lives. Demas anchors this quiet, hopeful book in today’s headlines of job loss and the surprisingly vital safety nets that support families. Her adult characters are multidimensional: her once powerful father struggles with depression, her glamorous mother fights to salvage her pride, and her charming grandfather falls in love with one of his customers. Irene and her friends are delightful, down-to-earth kids, including Jim, with whom Irene happily—and tentatively—explores first love. Never saccharine, this satisfying offering, with its solid storytelling and memorable characters of all ages, should please fans of Cynthia Rylant and Richard Peck. …an authentic portrait of country life, economic stress, and the tensions associated with a major life change. Irene's budding independence and inner strength add greatly to this absorbing coming-of-age tale. Interesting imagery abounds….characters are richly drawn….Quietly soothing and pleasantly entertaining. Demas sensitively describes the joys and anxieties of Irene's summer surrounded by friends and family. In areas where many children are experiencing a similar downsizing in their family's lifestyle, this book could find its niche with readers who can identify with the protagonist. In Everything I Was, Demas presents a likable narrator trying to negotiate friendships, family, and first love. Although Irene’s social class sets her apart from many readers, her concerns are universal, and she comes across as relatable and accessible. Readers will likely find themselves on her side as she comes of age in this earnest novel. Any teens who have had to change schools, had financial changes in the family, or been at odds with their parents can relate to thirteen-year-old Irene as she struggles to come to terms with each of these issues….Everything I Was will appeal to readers who feel a lack of control in their own lives. Irene’s struggle to find what she truly wants will inspire other struggling teens to do the same. The novel is a smooth read, which captivates the audience, making the reader want to read the entire book in one setting….This novel is for teens who want their voices to be heard. Any person interested in the dynamic make-up of family and friends will want to read this book. ...a touching story of a teenager who learns, the hard way, what is really important in life. This book would make a great gift for any young reader from age eleven through eighteen. It's a quick-moving, engaging story with a wonderful message about what is important in life. This coming of age story is a great read for young adults. Everything I Was is a timely tale in this age of economic uncertainty... What starts off as traumatic winds up being the beginning of a journey that takes Irene places she never knew were possible. With its focus on a family at the upper tier of the socioeconomic ladder, this novel puts an interesting spin on the theme of job loss and family hardship.... The main character... goes through a period of rapid maturation as economic necessity spurs her to seriously consider who and what really matter in her life. [Irene is] so endearing and so intelligent a character, making this story what it is. When the people around her aren’t providing the answers and protection she’s always felt, she’s able to rise to the occasion and help to bring her own life to a place where she can feel comfortable. It’s refreshing in this book to see a normal 13 year old girl, facing challenges but dealing with them in a very rational way. All the characters in this story are realistic and have vibrant personalities…This story will capture the attention of it's young adult readers and keep them turning pages to see how Irene works out all her problems. This is a coming of age story, very nicely done. Everything I Was is a sweet, realistic story. It's timely, sensitive and thought provoking. Irene's voice is distinct. Corinne Demas does not speak down to nor about teens. It was a pleasure to read and review this book. I'd recommend this book to tweens and even some teens that could relate to this experience. It's so well written, I may even tell adults who have kids in this situation to read it as well. I really think it gives great insight to the thought process of a group stereotypically called egocentric. This is a coming-of-age story, but as I read I felt that it was a reflection of our times and more importantly delineated the importance of how our young are being tossed to the winds as well. It’s a powerful story of life, love, and resilience you really might want to add to your list! Demas does a wonderful job showing the difficulties children face in this uncertain time. Although never explicitly stated, this novel takes a hard look at the current economic situation with which the world is struggling, an aspect we don’t see very often in fictional novels....it takes a detailed look at the effects of our economy on children. I really enjoyed this novel and it forced me to stop and think about life, and how we are all affected by change. I highly recommend this novel for all young adults and anyone with children. Corinne Demas’ writing style is straightforward and compelling, and highlights how little, everyday events change Irene’s expectations for life. She finds deep and lasting friendships with the Foxes’ and falls in love for the first time. She learns that life isn’t fair, and she learns to make the best of what she does have. A young girl struggles to control her life in this insightful novel. Irene's coming of age is set against the backdrop of the contemporary financial hardships, adding additional pressure upon Irene's maturation. This process is handled deftly, showing the slow steps and occasional errors made as each of us grows up. Characters like Irene's grandfather and Irene's new friends Jim and Megan are well-drawn and sympathetic, as is Irene. Everything I Was is an engrossing book centered around the main character, Irene, who is an appealing and sincere thirteen-year-old girl….With the characters so well fleshed out by Corinne, the story moves quickly and smoothly with realism that keeps the reader entranced…the sensitivity with which Corinne Demas handles the characters and a very credible plot, will appeal to adults as well [as to younger readers]. 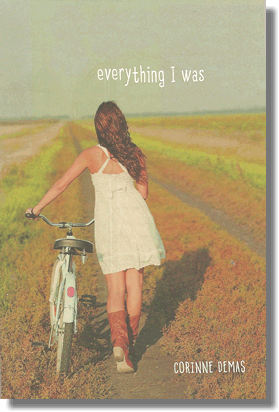 Everything I Was is a book which can relax and make you smile with the simplicity of the story and the great characters. As you read on, you're instantly grabbed by the country-air and the sweet smell of grass and rain. I could totally imagine myself there, along the whole time with Irene. Corinne Demas' writing is descriptive and so alive, it's flawlessly enrapturing and will hold you until the end. Irene is a very sympathetic character who tries her best to deal with the way that her life changes. I liked the themes of perspective and how people see different things in the same situation. From the cover I thought that this might be a dramatic story (or maybe even a supernatural one) but it's a very down-to-earth story about finding out that your parents might not have all of the answers that you thought they did. This was a really good read. It was fairly short (I plowed through it in a few hours) and written in a way that made it really flow off the page. Like many YA books, this is a coming of age story mixed with a little bit of fish-out of water drama....What I really liked was that it dealt with real issues. In the end Irene has to decide what she really wants and how to get it. I really enjoyed seeing her go from city girl to small town gal over the course of the book. You turn the last page knowing that everyone is going to be all right!